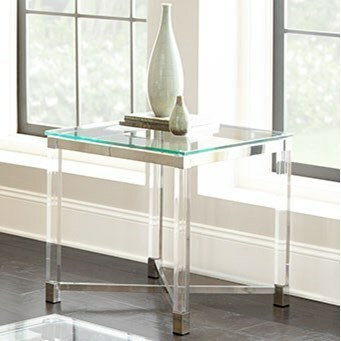 This modernly chic glass top end table stands on stylish acrylic legs and is supported by a metal frame and leg braces. The table is an incredible include in a medley of contemporary living areas. The Talia Glass Top End Table with Acrylic Legs by Steve Silver at Sam Levitz Furniture in the Tucson, Oro Valley, Marana, Vail, and Green Valley, AZ area. Product availability may vary. Contact us for the most current availability on this product. Browse other items in the Talia collection from Sam Levitz Furniture in the Tucson, Oro Valley, Marana, Vail, and Green Valley, AZ area.